That’s right — I’ve gained 20 lbs. since this all started. Do you know how far along I was when I had gained 20 lbs. with Hannah? Let me put it this way — I only gained a TOTAL of 30 lbs. with her. I know, I know — multiple pregnancies are totally different. Triplet moms are expected to gain around 50 lbs. before their babies are born. God help me! Just one year ago, I was pregnant with Hannah, so I had gained some weight. Then, after she was born, I breastfed and the weight literally fell off — and I couldn’t stop. I actually lost so much weight that my jeans were falling and I was even down to my pre-college weight again. No, no — I don’t think this was a good thing. Judging from people’s reactions, I think I was actually starting to look too thin and somewhat unhealthy. Believe me, I was still packing on the food!! The breastfeeding and working out was just a recipe for a lot of calorie burning. Anyway, here I am now — 20 lbs. heavier again. It’s not the numbers I’m concerned about here. It’s the amount of gaining and losing I’ve done in just under a year. That can’t be good for your body. I’ll just say this — after I have these babies, I plan on getting back to my normal weight and staying there for a LONG time!! Anyways, aside from the weight gain, I was surprised to hear how far along I was measuring. Basically, the stats above mean that even though I’m only 21 weeks along, my stomach is measuring like a woman with a single baby who’s 27 weeks along. I suppose I can believe it — I’m pretty big already. Nonetheless, the appointment went well. Dr. Dunlop seemed happy with my progress and confident that some of the symptoms I’ve been experiencing lately (a little bit of lower back pain, tightness, heartburn) were very common and nothing to be worried about. He said I’ll probably start to feel contractions a little more frequently, in which case, I should just lie down for a bit, lay on my side, and drink plenty of water. If they don’t go away or if they become more intense after that, then I should call him. 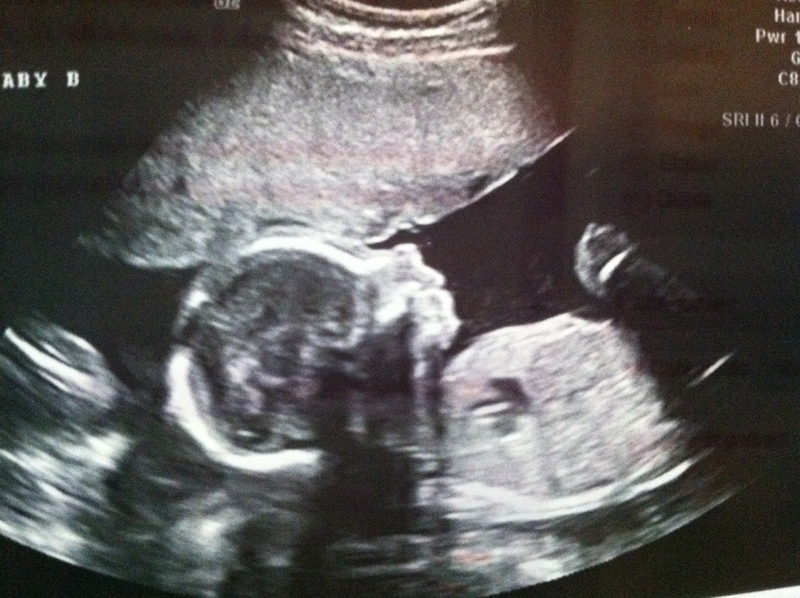 A nice profile shot of Baby B (on my left side). I also met with a nutritionist yesterday. She was very helpful and gave me great suggestions for food intake during the rest of my pregnancy. We looked at my diet and discovered that even though it’s pretty well-balanced and includes a good amount of fruits and vegetables, I need to drastically increase my protein intake and add about 1,000 more calories every day. (Jealous? At least there are some perks to this experience!) She told me to stop choosing light options (low-fat yogurt, skim milk, etc.) and to find new sources of protein besides just meat. So she encouraged me to try Carnation instant breakfast shakes and Snackwell granola bars, which both have a significant amount of protein. I tried the shake this morning for breakfast and it was good — just like chocolate milk. My favorite part about the nutritionist was that she was “real.” She didn’t reprimand me for having a few chocolate chip cookies every once in awhile and she was practical about where I could get some of the needed nutrients. I’m pretty traditional when it comes to food — nothing fancy. So this was refreshing to hear. I have another appointment this Friday — this time, with a Maternal Fetal Medicine (MFM) specialist. They’re going to do an in-depth ultrasound where we look at each baby close up and discuss the risks and “more serious stuff” of a multiple pregnancy. These guys are the experts. They will be there when I deliver, I believe. I’m not really excited about this appointment because it’s apparently going to take THREE HOURS. (sigh) I already feel like my regular appointments keep me from work enough as it is! Now I’ll have to make this up too. Plus, Dr. Dunlop says after our next appointment in two weeks, he wants to start seeing me once a week. Great. So, just feeling a little engrained in all of this right now. Everything seems to be about the triplets, no matter who I talk to. Not to mention, I have to carry around a basketball-sized hump under my shirt with me everywhere I go. I’m already exhausted from all of this! (more mentally than physically) Luckily, this will be a shorter pregnancy than the last (am I allowed to say “luckily” about that?) and this is the last time I’ll ever have to be pregnant again. I’ll leave you with a fun moment we had tonight — Hannah’s first toothbrushing experience! 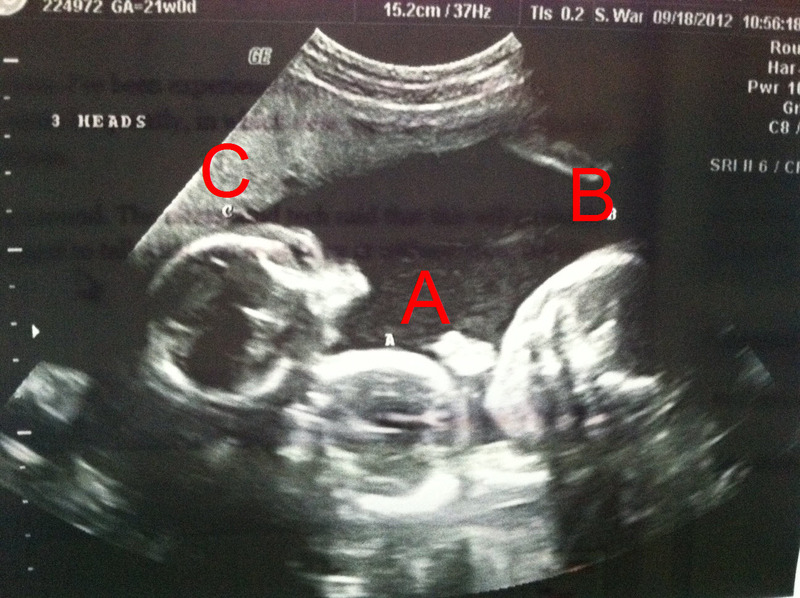 Okay the ultrasound pics make me cry. BEAUTIFUL!! And I want that cuddly han all to myself!!! Hang in there Stephanie. It is really hard carrying multiples. You are doing great. Just continue to take it one day and appt at a time. Once they are here you will forget about how hard it was to carry them all at the same time. You are taking wonderful care of yourself and giving your babies a great place to develop. YOU GOT THIS! opps meant Stefanie! BTW, love the pic of Hannah. She is going to be such a wonderful older sister. She is a sweetheart! I had to really work on protein intake last spring. I made smoothies with whey protein powder that were delish. Also, freak yogurt is high, and if you buy a product called PB2, which is powdered peanut butter, you get even more protein. Stir a tablespoon or so into the yogurt. Delish, virtually no sugar. So great seeing the three heads together (they are already friends and chatting about boys probably!) Things are getting more “real” I know, the most important thing is to take care of YOU! What great news from a doctor to eat MORE! A mom loves to hear that her babies are healthy and growing – every appt confirms that the babies are doing just great! Keep it up! Mom gave me the update about today’s appointment as well. You’re doing great honey despite the hassles you have to endure. We’re proud of you. Hannah was so cute in the “Attack of the Han” video and the toothbrushing one as well. Love you guys.